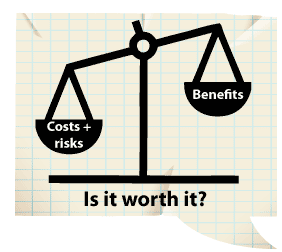 Is your project really worth it? Have you ever worked on a project where you asked “what’s the point”, or felt that you shouldn’t be wasting any more effort on it? I have, and it makes you wonder who is really in control and whether they really understand why a Business Case is essential. I’ll give you an example. Some time ago, I was asked to take over the management of a project 4 months in because the previous project manager was moving on. The project would deliver an I.T. system which would interface with a data feed containing financial trade data, do some calculations and then dump out the results into some reports and files. Pretty simple really, although for reasons I won’t go into the developers had chosen a solution which was way over-engineered. The end result was that the system was beset by quality problems. This was coupled with the fact that the data feed which was being developed by another project wouldn’t be ready for another 6 months. I raised this with my boss who was in overall charge of the development and he said it didn’t matter if it didn’t work – in fact it had failed all tests until that point – but what was important was that it was delivered into the data centre on time. So, I dutifully obliged, and ensured the server was delivered on time, even though it was just a useless box sitting there doing nothing because there was no data to process, and no ability to process it anyway. So why had my boss insisted on wasting time and effort installing a useless box with unusable software? Simply because his bonus depended upon him showing he had met his targets. The project was for a very large and very successful international business which just goes to show even in huge successful organizations there can be an alarming lack of understanding about project governance and business justification. On this particular project there wasn’t a Business Case which described why we were doing it, or quantifying the benefits which would result from it. In other words, there was no justification for the investment of time and money which would be required. As it turned out, after a year the project was eventually cancelled, primarily because of the ongoing quality problems associated with an overly complex technological solution. In retrospect the organization could have saved itself a whole load of money by not proceeding in the first place. This decision would have been made easier had a Business Case containing a thorough cost benefit analysis been developed by the organization at the start. Can any lessons be learned? Yes, firstly never start a project without a Business Case and secondly, educate more senior decision-makers in the necessity of project governance. Whilst the first is much easier than the second, both are essential to ensure your organization doesn’t waste even more time and money. Have you worked on projects which were a waste of time and/or money? Do your projects always have a Business Case?